A new breakfast and brunch spot offering coffee, tea and more has debuted in the neighborhood. Called Colectivo Coffee, the fresh addition is located at 2261 N. Milwaukee Ave. between Belden Ave. and St George Ct. in Logan Square. This newcomer, which has another location in Lincoln Park and 16 cafes in Wisconsin - where the company is headquartered - specializes in hand-roasted, single origin coffee beans, house-made breakfast and lunch fare, artisanal bread and baked goods. On the drink menu, expect to see a wide array of options. There are traditional espresso drinks like lattes, mochas and cappuccinos, as well as blended drinks. The spot also offers smoothies like the "Green Hornet" with kale, apple, pineapple, cucumber, celery and lime. Take a look at the full drink menu here. Switching over to the all-day breakfast menu, look for items such as a potato bacon burrito with cheddar, smoked salmon sandwich with cucumber-dill cream cheese, tomato, red onion and baked oatmeal with seasonal fruit. For lunch, there's a roasted chicken chipotle sandwich with coleslaw, pickles and chipotle mayo, a falafel burger with hummus, cucumber, and cucumber-mint dipping sauce and a curry chicken wrap with walnuts, golden raisins and dried cranberries. The cafe serves a selection of gluten-free items and does catering for groups. You can check out the full food menu here. With a 4.5-star rating out of three reviews on Yelp so far, Colectivo Coffee has been warmly received by patrons. 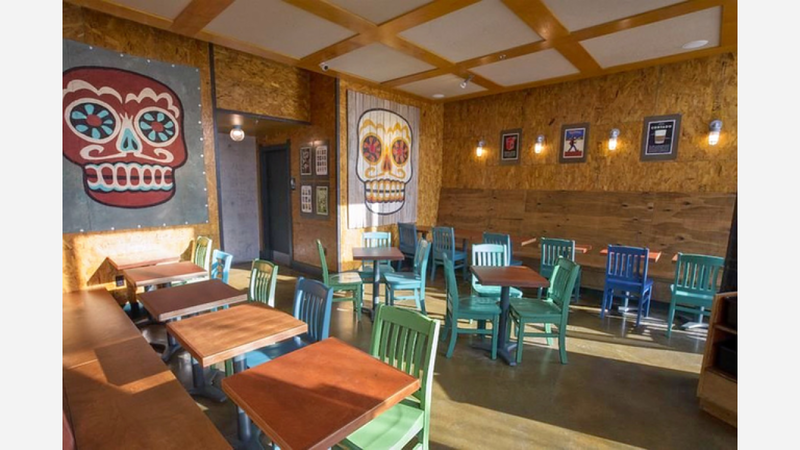 Amanda S., who was among the first Yelpers to review the new spot on Dec. 24, said, "The wait is finally over. The staff is helpful and friendly, the space is gorgeous and accommodating, and the coffee and tea is perfect. I will be a regular here." Yelper Arelys V. added, "I was super excited to try this place out because I drove by a few nights before they opened, and it was bumpin'! My fiance stopped in one morning to get me an almond milk matcha latte and I enjoyed it." Ben Y. said, "Interesting eats, great bakery items, and a variety of lunch and breakfast sandwiches. Nice outdoor patio with a giant firepit. This a great place." Swing on by to take a peek for yourself: Colectivo Coffee is open daily from 6:30 a.m. to 9 p.m.